Righting an old wrong, This story was published in the Tri-CityHerald.com, Sunday, December 14, 2003, by John Trumbo Herald staff writer, permissions granted. San Jose Mercury News article on German American internment <<Click here to read this article --permissions granted by WR Permissions. Posted June 27, 2001. The Other Camp <<Click here to read this article by Young Chang, September 2, 2001. Permissions granted by Daily Pilot-Los Angeles Times. The courage to be kind Unlikely WWII friendship echoes 50 years later: The courage to be kind, Mary Giunca, Winston-Salem Journal, May 24, 2001. "WITH LIBERTY AND JUSTICE FOR ALL"««Click here to read Congressman Ciro D. Rodriguez' (D. Texas) Washington D. C. update of November 19, 2000, and learn more of the truth regarding the internment of German Latin Americans in the United States during WWII. Some of the faces, names, signs, voices, and words of the times--World War II. Captain Easy of the Wash Tubbs comic. "Patrolmen and detectives have received lists of aliens [permanent residents] who have registered with the government. On orders from Commissioner Valentine commanders of detective divisions will get complete histories of these aliens to go into precinct dossiers. Detective and other city operatives will visit every person who registered...they will check home and business address, daily activity and routines. Dossiers will be made of aliens of enemy nations, natives of Germany, Italy, Japan, and their lesser allies. 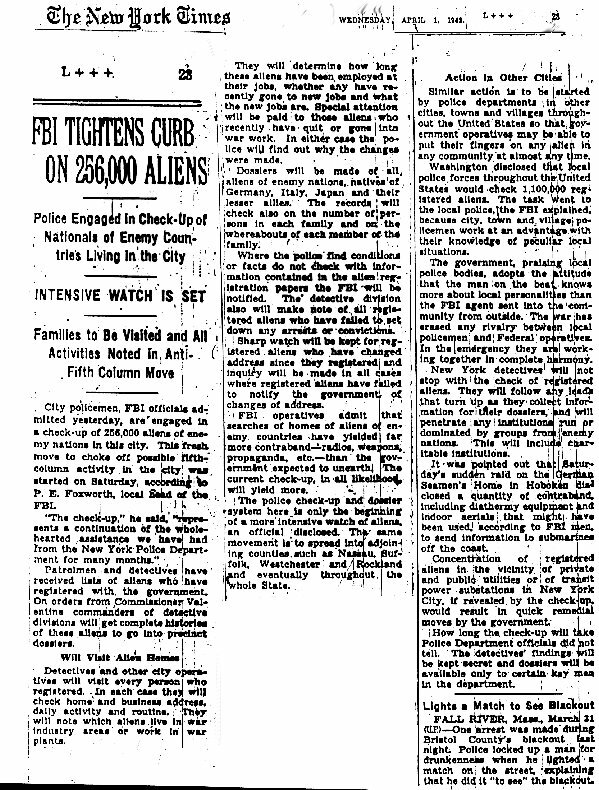 The records will check also on the number of persons in each family and on the whereabouts of each member of the family..." Editors note: This practice was planned throughout the country for the 1,100,000 permanent resident aliens, Germans, Italians, and Japanese, residing in the United States. It began with the 256,000 permanent resident aliens in New York City. For more of the cited article click on the The History of Internment link below, then proceed to the April 1, 1942 entry.